Note: I had every intention of sitting down today and writing out the rest of my tips for better bread baking. But it is too hot to even think about baking bread, and so I offer up this more refreshing post instead. Despite the heat, I am planning to make sourdough onion rye tomorrow, so hopefully that will inspire me to finish the list. Check back soon! I recently celebrated a major success in the garden. After eleven years, I finally harvested my first raspberry crop. It wasn't big enough to make jars and jars of jam or anything (oh, just the thought makes my mouth water), but it was deinitely more than the two or three berries that made up previous bounties. I have planted various types of raspberry canes at least six different times in at least six different places, but for one reason or another (poor soil, not enough sun, poisoned by the roots of a nearby walnut tree), they never did very well. And then two years ago, my little brown raspberry-growing thumb turned green. That was the time my Latham red raspberry canes arrived in the mail before I was ready for them. Not only had I been unable to locate 30 linear feet of suitable growing space that was safe from marauding sheep, but the moonsigns were also wrong--it wasn't a good time to plant (and I needed all the help I could get). If the roots are sufficiently moist, most mail-ordered plants and canes and even trees can usually survive a few extra days in their original packaging. I was looking at weeks. Desperate, I decided to temporarily plant them (much too close together) in the mounded-up soil along the south-facing side of the greenhouse. They went wild. Inspired, last April I purchased six baby raspberry plants at a nearby farmer's market for fifty cents apiece. They were "suckers" that had been dug up from the seller's garden, which meant that they were already accustomed to our inhospitable climate. I was assured that they were trouble-free and would produce delicious berries all summer long. I planted them along the north-facing side of the greenhouse and mulched them with lots of hay and sheep manure. They are so happy that some of them are already covered with blossoms. But back to my ruby red bounty. What to do with them? What to do? Something so precious as one's first raspberry crop requires thoughtful consideration. No gobbling them up straight from the colander. No burying them in brownies or smashing them into a sauce. They should be presented in their original luscious beauty, but in a way that will make the small harvest go further. Aha! I dusted off my recipe for Really Raspberry Tartlets. I created this recipe years ago when I was still living in California. I would buy pints and pints of both red and golden raspberries from Kozlowski Farms at the Thursday Night Farmer's Market and make two-toned tartlets. In her book, The Berry Bible, author Janie Hibler explains that "when seeds of red raspberries are grown, about one out of every 1,000 produces yellow or apricot colored fruit rather than red. Other than color, these raspberries are the same as typical red raspberries. The most widely grown cultivar is Fall Gold." I believe Kozlowski Farms was the first commercial grower of golden raspberries. They travel well and are perfect for all kinds of meals and settings. You can pack them on a picnic or brush them with a red currant jelly glaze and serve them at a formal dinner. You can arrange them on a large platter garnished with fresh mint leaves and set them out at a buffet. They require no silverware, are not messy, and can be eaten standing up. I call them Really Raspberry Tartlets not because of their overpowering berryness (though I suppose you could pile a lot more berries onto them if you wanted to), but because that is what they are: a really nice way to showcase your raspberries, really simple to make, really easy to gobble up two or three before you've realized it. They are made with a very friendly cream cheese pastry which you do not even have to roll out. I actually taught an entire class devoted to this delightful dough called "Never Fail Cream Cheese Pastry To The Rescue." If you have never produced a decent crust in your life, you can successfully make one with this recipe. Variations of it abound in cookbooks; it is a caterer's secret weapon. I do suggest that you make enough to allow for more than one tartlet per person, as they tend to disappear rather quickly. As always, I encourage you to use organic ingredients whenever possible. Using an electric mixer, mix together flour, cream cheese, butter, and salt until a dough forms.Wrap the dough in plastic and refrigerate at least 30 minutes (or up to 24 hours). If chilled longer than 1 hour, let the dough warm up at room temperature for about 20 minutes. If you are in a hurry, you can place the dough in the freezer to chill for 15-20 minutes. Divide the dough into 10 balls and place them in a standard size muffin pan. Press each dough ball into the bottom and up the sides of the muffin cup to form a shell. Bake at 350 degrees until nicely browned, about 20-25 minutes. Carefully invert the pan to the remove baked shells, and cool on a wire rack. (Note: the pastry shells can be made a day in advance or even frozen). With an electric mixer, beat the cream cheese with the powdered sugar until smooth. Beat in the lemon juice. (May be made a day ahead; chill until ready to use.) Spread a heaping tablespoon of the cream cheese mixture on the bottom of each cooled pastry shell. Arrange the berries on top. For a more formal presentation, just before serving, heat 1/2 cup red currant jelly in a small saucepan and use a pastry brush to glaze berries with the warm jelly. Refrigerate until ready to serve. The tartlets will keep for several days in the refrigerator (though they will not look quite as pretty as when first made). The cream cheese filling will soften and almost melt into the pastry shell, giving them a different (but very nice) taste and texture. © 2005 FarmgirlFare.com, the award-winning blog where Farmgirl Susan shares stories & photos of her crazy country life on 240 remote Missouri acres - and where it's okay to eat raspberry tarts for breakfast because after all, they do contain fruit. my oh my no more raspberries in athens but am back to france soon and the marche sells fantastic framboise. Even more jealous... but wait til next year when you will be able to make jam! Oh, yum. I experimented with growing some potted strawberries this summer, but it's just too hot here for raspberries. These look delicious! You'll have to let us know how those other plants turn out. Raspberries definitely don't grow here and yours look so yummy that I wish I was in Missouri. The tart recipe looks so simple that I am now itching to try it. It won't be a raspberry tartlet though as they cost a bomb here but maybe I'll make it with some tropical fruit. After hearing from all these folks who say that raspberries don't grow where they are, I am happy to bein Appalachian Ohio. But, they are certainly more delicate than their wild cousins, the wineberries, which will take over woodland settings. I can hardly wait to terrace our backyard! Raspberries, blueberries, strawberries, asparagus, fruit trees--ah. The things to look forward to. Oh you could probably use any kind of fruit. How about something delicously tropical that we can't get here? I'd love to see a photo. Your terraced edible backyard sounds delicious! Dear Lady - what a treat that recipe appears to be. As for me - it'll have to wait a few more pounds - doing an extreme dieting phase but this definitely gives a reason to anticipate my athletic self indulging in a tartlet! Good luck with the raspberry canes - they look almost lethal - but VERY long leather gloves and a gentle touch might save the day. i like the idea of tart shells from a muffin tin. i think that's brilliant. I am going to make tarts for my brother's wedding. Would you recommend this dough? Any other suggestions? I wanted to do a lemon filling, would this work? Thanks for your help! I am really sorry for not getting back to you much sooner. Tarts for a wedding sound wonderful, and I would very much recommend this pastry dough. It is quick to make and virtually foolproof. I have used it to make everything from savory mini quiches (don't prebake the shells) to lemon curd tartlets--simply fill pre-baked shells with spoonfuls of lemon curd and you're done. I also left So. Cal and moved into an old farm house in PA. I too tried for three years to grow raspberries. Dismal failures. One I rescued, before it too would have died, and potted it up in an old large nursery container. I set it by the steps to our patio and mounded mulch around it for the winter. I figured I would find another location for it the following year. Come spring I had shoots popping up all over the place! Some of these I transplanted to where my former failed raspberry row was. Took my sister's advise and did this in the late fall last year and guess what? They're taking! I'm hoping for enough raspberries this year to make Hallon Saft which is Swedish for Raspberry Syrup. Put some ice in a tall glass, add raspberry syrup and water. It's delicious, especially on a hot summer day. Can also be made with strawberries, blueberries, lingonberries or even oranges. Kids drink this all summer long in Sweden, as did I when I grew up there. The syrup is also wonderful poured over ice cream... or a splash in a glass of champagne or white wine. Yum. Next year if I get a good crop I will make jam. I also planted Wineberries, blackberries, blueberries (still sad looking)and a gooseberry. Strawberries I already had. I'm crazy about berries, can you tell? Considering rhubarb and currants as well but must find space. 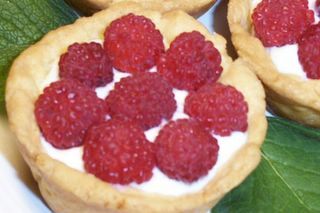 I will definitely try the raspberry tarts, they look scrumptious! LOVE the recipe for the dough. plan to return with tons of blueberrie. Want to get baking! Welcome to the farm! Thanks for the kind words. As far as printing out recipes, I'm working on installing a printer-friendly option, but for now the easiest thing to do is copy the text of the recipe and then paste it into Notepad or Wordpad or something similar. Then you can print out that text-only file. I absolutely loved this recipe, but since I live in south Texas Raspberries aren't really available. But what I do have in excess is Mulberries and Figs. My first batch was topped with the Mulberries and a little powdered sugar and was an amazingly pleasant teeth staining experience. For the second batch I sliced figs into little crescents hit them with my trusty torch to make the flavor pop then covered the whole affair with powdered sugar and a bit of cinnamon. I liked the figs on the cream cheese but I'm thinking on the next one I'm going to caramelize some sugar then when its nice and hard just crack little pieces on there. I made these tarts. Next time I will shape the pastry a little more to compensate for the shrinkage. I'm also thinking I might add a spoon full of sugar to the dough. The filling was very good but, again, next time I might add a little more sugar to it. Overall, this recipe is VERY good and VERY easy, it just seemed to lack in sweetness. I'm sure my store bought raspberries didn't help much because, usually, raspberries are best when just picked. I feel silly commenting on such an old post, but I made these tarts the other day, with both fresh blueberries and raspberries. I do NOT have a sweet tooth for sugar (the sweetness of berries is different, of course) so I found both the pastry and filling perfect for my quirky tastes. On the other hand, my husband adores sugary things, but he loved your tarts, too. THANK YOU for giving us a dessert recipe we can both enjoy. Now I have people asking me to make these for them. I made these tarts and they were excellent. I do recommend the glaze, it adds just a hint more sweetness. Thanks much. Have you tried this recipe with light cream cheese? That's all I have right now but am willing to go to the store for the good stuff if necessary. Thanks! I've used the 1/3 less fat cream cheese and it comes out fine, but I don't recommend fat free cream cheese. Enjoy!